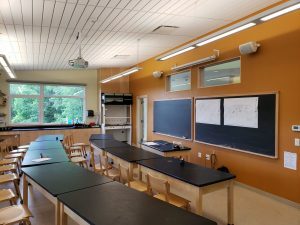 Ian MacDonald Presents at an NESEA Pro-Tour Session | Allied Engineering, Inc.
Ian MacDonald, P.E., Principal and Mechanical Engineer at Allied Engineering presented at a recent NESEA Pro-Tour session held at the beautiful new Maine Coast Waldorf High School in Freeport, Maine. 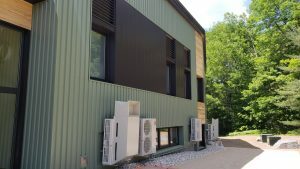 This building is the first Passive House/Net Zero High School in the U.S.
Air source heat pumps for efficient heating and cooling. Roof mounted solar panel array is sized to produce at least as much electricity as the building is projected to use.